Hyundai's teaser picture shows that the Kona will have LED daytime running lights positioned above the headlights, an arrangement the brand says will help it stand out from rivals. 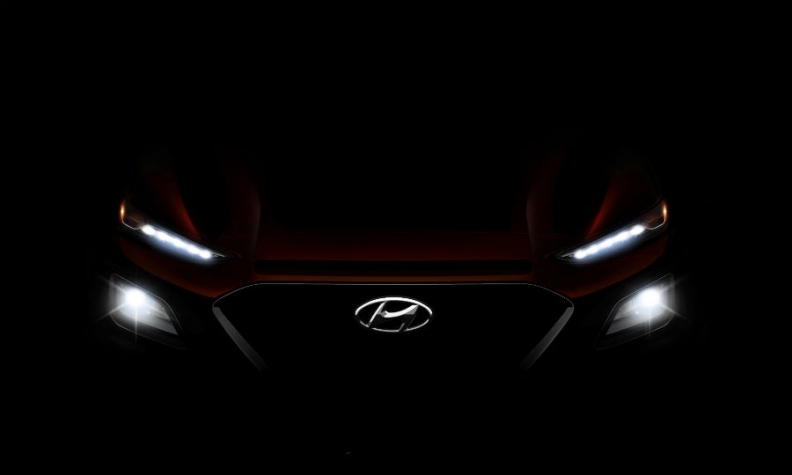 TOKYO – The upcoming Hyundai Kona, the South Korean brand's attempt to break into the hot subcompact SUV/crossover segment, will get "twin headlamps" with running lights positioned above the main lights as Hyundai looks to set its entry apart from an increasingly crowded field. A teaser shot of the Kona released on Friday shows a frontal view with sliver-thin chains of LED running lights up high near the seams of the hood. The unorthodox arrangement is reminiscent of the funky placement on the Nissan Juke, another crossover known for its styling. "The new twin headlamp enhances the visual impact, with the LED daytime running lights positioned on top of the LED headlights,” Hyundai said in a release. "The separated lights at the front deliver a confident, progressive appearance with sleek and sharp shapes." The Kona will deliver good driver visibility and comfort, with agile handling, Hyundai said. "The imminent arrival of Kona," Hyundai said, "marks Hyundai Motor's bold first move into the B-SUV segment and leads the wider expansion of its SUV range." Sales of small crossovers are booming in Hyundai's key U.S. and European markets. Hyundai, a late-comer, has been unable to tap that growth. Subcompact crossover sales in the U.S. climbed 12 percent in the first quarter, while compact crossovers were up 5.2 percent. The overall market, meanwhile, retreated 1.6 percent. In Europe, the Kona joins the small SUV/crossover segment whose volume is forecast rise to above 2 million in 2018 and to 2.3 million by 2020, according to market analysts at LMC Automotive. The Kona takes its name from the lava-lined coastal district of Hawaii's Big Island in keeping with Hyundai's SUV nomenclature that is based on travel destinations. Hyundai said the Kona's official unveiling is scheduled for the summer. Its public debut is expected at the Frankfurt auto show in September. The Kona is expected to go on sale in the first quarter of 2018, filling a critical gap in Hyundai’s lineup.